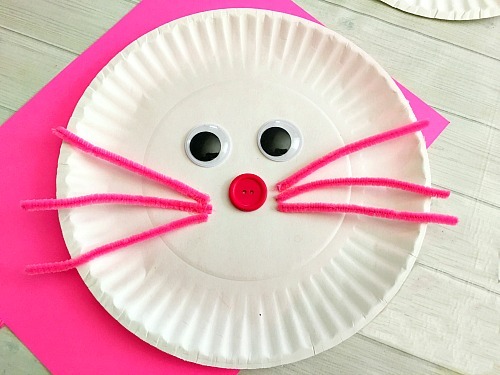 Cute Bunny Paper Plate Craft for Kids- Fun Easter Kids Craft! The last time my kids did a paper plate craft was Christmas, and they’ve been begging me to do another one. I completely understand! 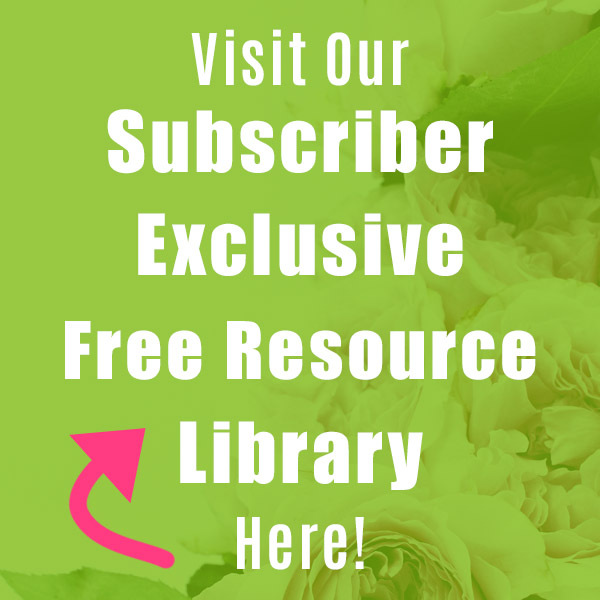 Paper plate crafts are fun and easy to do, but come out looking great! I also like how inexpensive they are, and the fact that they’re a kids craft that’s not messy. 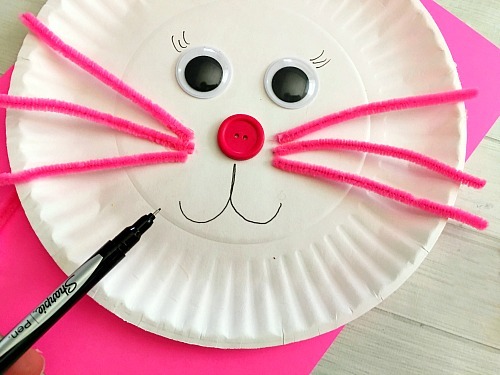 So I had to think up another fun paper plate kids craft, and since Easter is coming up, I decided to use that for inspiration! 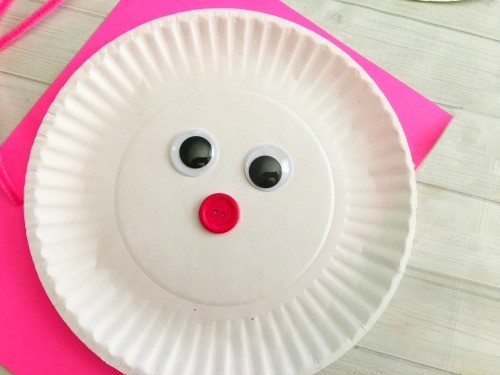 The result- this Cute Bunny Paper Plate Craft for Kids! 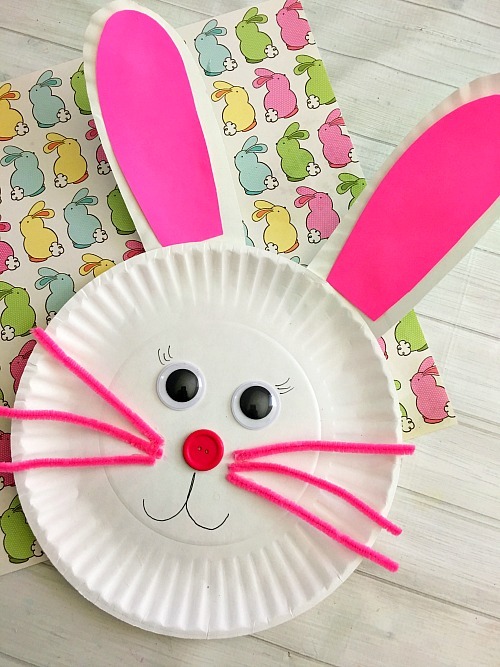 This bunny paper plate craft for kids could be a great way for your kids to be entertained now (especially if they’re on spring break! 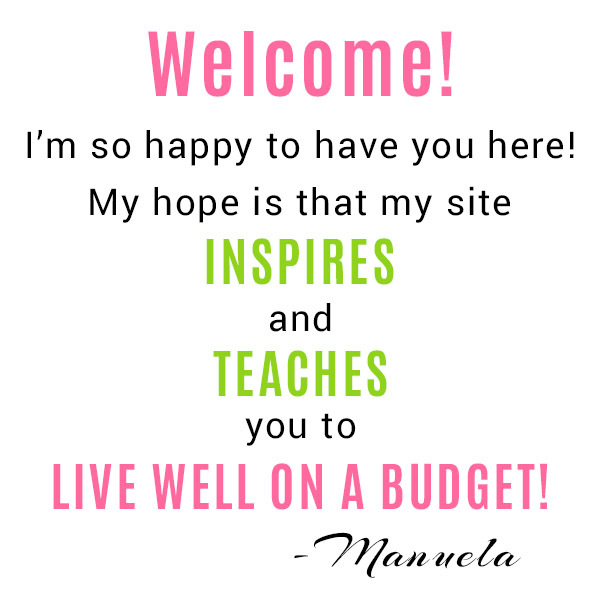 ), or you can save this one for them to do on Easter! If you have very little kids, it only takes a minute to pre-cut the bunny’s ears for them (so they don’t have to use scissors). And you definitely only need craft glue for the main glue in this kids craft, though hot glue is also fine (and obviously creates a stronger bond). 1. Carefully glue two googly eyes toward the top center of one of your plates . Then glue a pink button below the eyes for the nose. 2. Cut your pipe cleaners into 4-5″ pieces and glue 3 on each side of the nose for the whiskers. 3. Draw a mouth below the nose and a few eyelashes on each eye with your black pen. 4. Then cut out two long ears from your second paper plate and two smaller ears from your pink card stock for the inner ears. 5. Glue your pink ears to your white ears with your glue stick and then use your craft glue to glue the white ears to your bunny’s head. 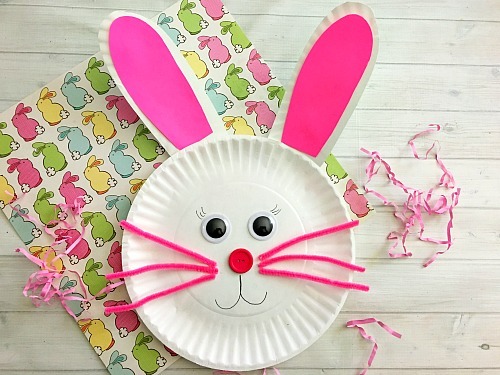 Then your cute bunny paper plate craft is finished! 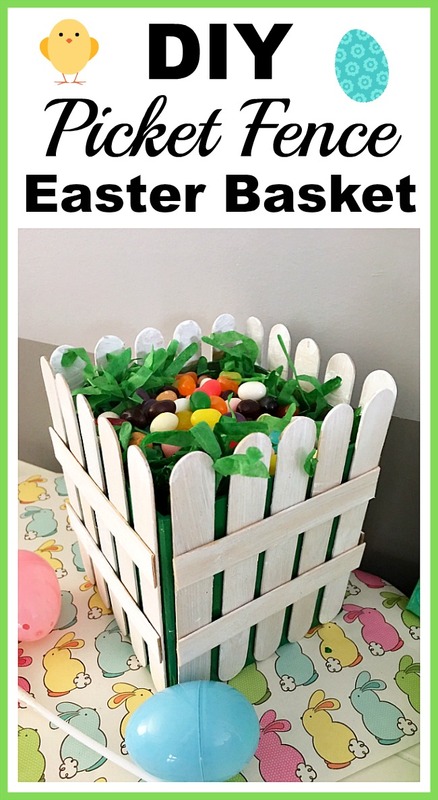 Or you can make this kids craft last longer, and give your kids crayons to further color their bunnies. Or how about some pom poms or sequins to glue on as “hair”? 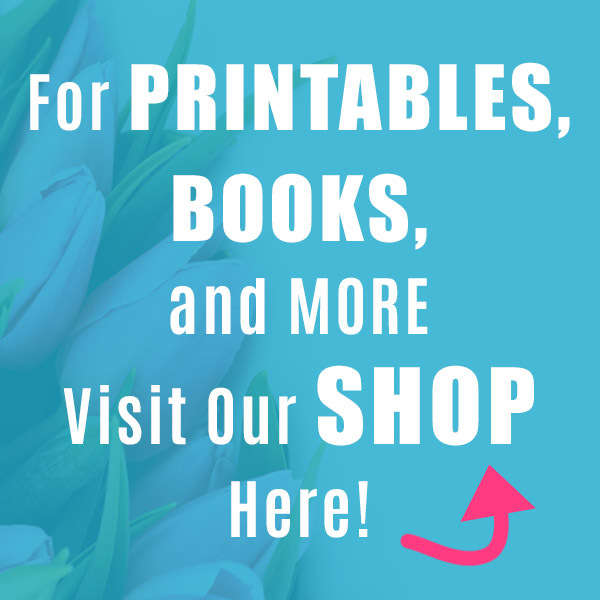 The possibilities are endless (and fun)! 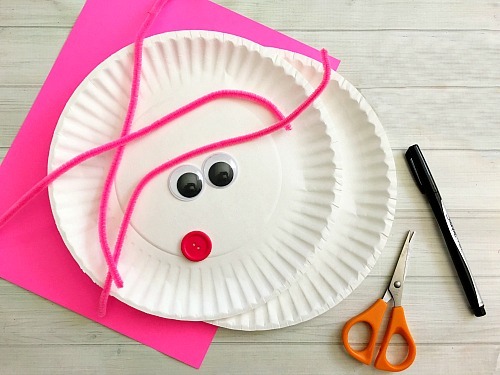 Do your kids do paper plate crafts often? « Lucky Charms Treats-They’re Magically Delicious! Now that’s just adorable! 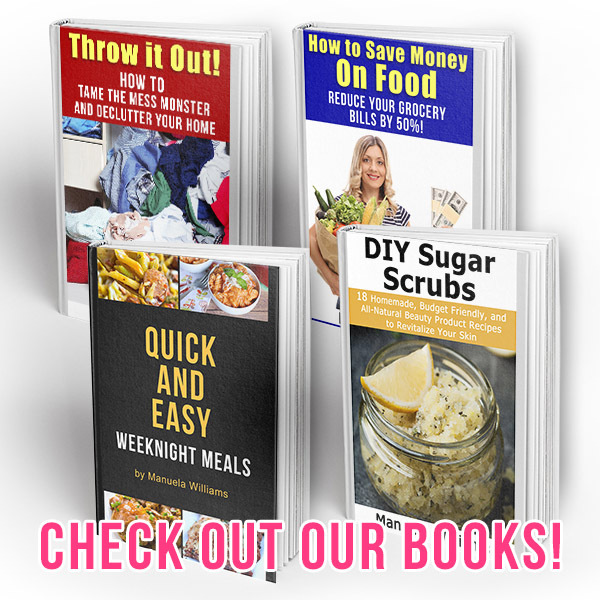 I’m pinning it to do with the kids later!